Assisting the Gauteng LGBT (especially transgender and crossdressing) community, with makeup, accomodation, storage, fashion (personal shopping) and transformation services. Safety and discretion guaranteed. Fun and happiness assured. Johannesburg, South Africa. Many crossdressers have a lot to lose. Many of us have a marriage, children, careers and a standing in the community that we want to protect. We are very concerned (given society’s general lack of knowledge and understanding about crossdressing and transgender issues) that if we are discovered, we stand to lose some or all of these things. Often we fear losing our families and careers most and are concerned that if our spouses or bosses discover that we are crossdressers we will almost certainly lose these things that we value the most. For this reason we keep things as private as possible. Sometimes this means we end up keeping secrets from those that we love the most. Sometimes we may end up lying to those people. This can be a very difficult experience and one that adds pressure, strain and stress to our already hard lives. I am of the opinion that it is better to be honest with people. However I also appreciate that when it comes to something like crossdressing it is very hard to predict how people will react, especially when it relates to a spouse or other close family member (I have heard of otherwise very open and liberal people freaking out when discovering this about their spouse and I have also heard of very conservative and otherwise ‘straight’ people being very accepting). Additionally it is true that once you have ‘rung the bell’ you absolutely cannot ‘un-ring’ it. Once you tell someone you have reached the point of no return. Either they will accept you or they will not. If they do not, they will almost certainly look at you in a different light… This can place intolerable strain on us and our relationships. For this reason discretion is an absolute necessity. You need to have a very good idea of how your revelation will be received and you need to be comfortable with the consequences of that revelation, whatever they may be. If you are not prepared to accept the worst case scenario, it is probably better to keep quiet. This in turn leads to a serious problem. How do you live your life as you want and need to live it, without causing distress. Additionally how do you live a life of integrity and how do you avoid deception? If you cannot afford to get caught crossdressing, do not get caught. Make sure you only dress in a safe and secure environment. Always make sure that you pack away all evidence and crucially make sure that all traces are removed. If a spouse finds lingerie, traces of makeup and stray hairs she will certainly think you are having an affair before she thinks you are crossdressing. This will just make life worse. You therefore need to make sure that all your clothes are stored in a safe and secure place. I would suggest off site storage is best. I know a number of people store their clothes in their offices. This is an idea but remember your office is not yours, it belongs to your employer, so there can be very little expectation of privacy. An employer is entitled to enter a cupboard looking for documents, files etc and in so doing they may discover your stash. It is not unreasonable for them to ask questions. This could result in difficulties at work. Given that a salary is your greatest asset as it enables you to meet all your other goals (financial and otherwise) you really do not want to lose your job. I would therefore advise against storing clothes at work. A better off site solution is a self storage unit of some sorts. However these are often expensive as you end up paying for far more space than you need. You will then need a place to dress. More often than not the opening and closing times of self storage units may not suit you, especially if you are dressing at night and you then need to find somewhere to store your clothes for a few hours before and after you dress. This complicates your life. You will also need a place to dress and undress and wash. Even if you can dress in your storage unit, finding somewhere to wash will be difficult. Entering and exiting the unit may also be difficult as the staff may not be as tolerant as we would like. You may be able to use your home but you will then be constrained by the movements of the rest of your family and you run the risk of being discovered due to someone returning unexpectedly or you may leave something incriminating out. A better solution is to find a hotel or similar establishment where you can dress, wash etc. But obviously this will add costs and can be tricky as you will need to pay by credit card, register your name etc. And again if your spouse does discover a receipt or credit card bill with a local hotel listed her assumption is not going to be the truth. She will believe you are cheating on her. I have also heard of people dressing in their cars, driving around late at night, taking risks and not being safe. Not only are you risking your life and safety but you are also risking exposure by doing this. Sadly violent crime, hijacking and other concerns are a very real part of life in South Africa and transgender people are statistically at a greater risk of being victims of these crimes. Not only are you risking harm, you are also risking discovery. I would caution against this approach. It is just not worth becoming a statistic and having your wife find you in the emergency room wearing your stilettos and leather mini skirt! This is why we have established Priscilla’s Services. We believe our establishment offers you the ability to live your life as you need to, without risking all those things you hold dear. Our core service offering includes storage for your clothes and a safe and well appointed place to dress and wash. All at very reasonable prices. For those of you who cannot risk telling those that you love, please be safe, please keep your privacy and trust us to be discreet. Our facilities have been developed with you in mind. We are here to help. Next Next post: Priscilla Queen of the Desert! Need to book overnight accommodation? Follow the link below. For all your LGBT friendly accommodation needs in Johannesburg you can now book directly with us using our easy to use online booking platform on our accommodation website. Sleeping-OUT's Guest Satisfaction Award. 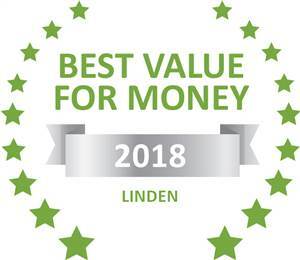 Based on reviews of establishments, Priscilla's Suite and Studio has been voted Best Value for Money in Linden for 2018. Priscilla's Services Blog at WordPress.com.